The laptop computer was hooked up to the speakers by the western wall and the Elsewhere Right Now concert, the accapella concert by The New Noise Trio, the piece recorded in the gallery using the instruments built there,the recordings by Kartoffel Menschen Trio and the covers of songs by Marit Bergman, Jens Lekman and Fred Astereo were played through them. On the screen could be seen a movie of streaming water. 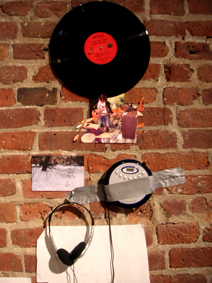 The CD-player on the western wall (which had contained the acapella-piece "The New Noise") was removed. 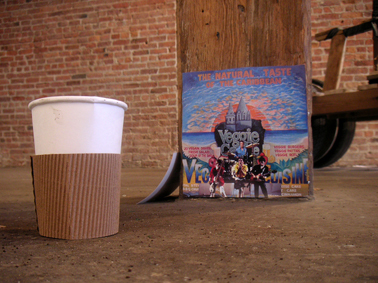 A color-printout of a collage of the band The Clash in front of a wall-mural depicting a castle in a sunset and a text reading "The natural taste of the Carribean" was placed on the pillar, where it meets the floor. 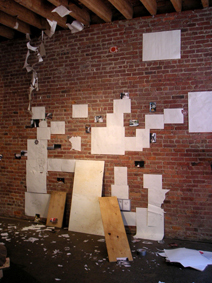 In the CD-player on the inner eastern wall could be heard recordings of the songs recorded during the show "Radius of my Heart" (which took place at Galleri Wuthering Heights in Malmo, Sweden). 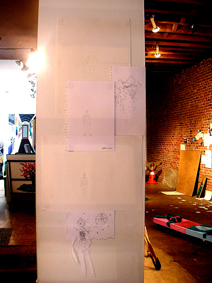 Above the CD-player a cut-out color-printout of a figure playing instruments was placed. 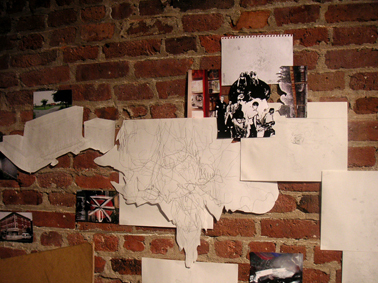 Above this figure, in turn, a vinyl LP-record ("In God We Trust, Inc", by the Dead Kennedys) was attached to the wall. 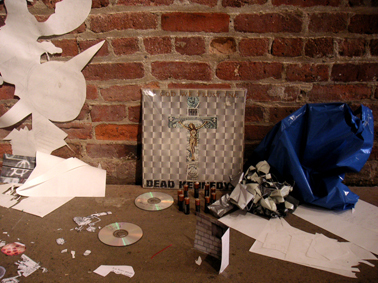 The sleeve to the album was placed on the floor right beneath it, leaning against the wall. 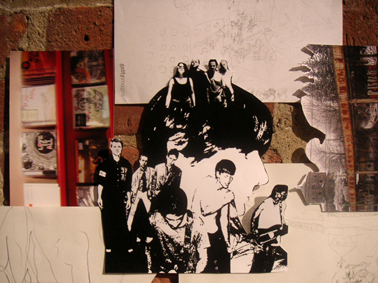 A cut-out printout of a collage (depicting a large head surrounded by members of the bands The Clash, Sonic Youth and the Pixies) was placed above the drawing of a figure spray-painting an "anarchy" sign, connecting it with the drawing of a band performing in the "Sound-Fix" record store. 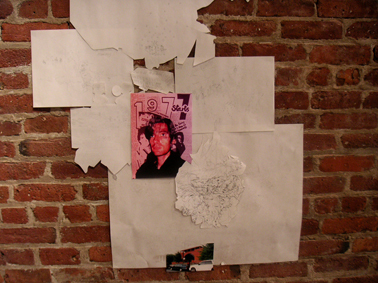 A color-printout of a figure with a collage in the background reading "1977 starts" was placed in the middle of the cluster of drawings containing the drawing of a pool-park, the band Cause Co-Motion, the cut-out drawing of a building ("Studenternas Hus"), the cut-out drawing of the band Sonic Youth performing and the drawing of a building with instruments in it and the text "The revolution starts on monday". 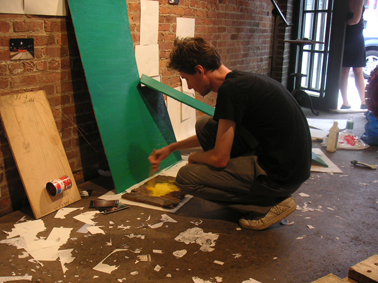 A large sheet of wooden board was taken into the gallery (having been found on the sidewalk outside) and placed leaning against the inner eastern wall underneath the drawing of a walking figure and the word-balloon reading "Boys don't cry". 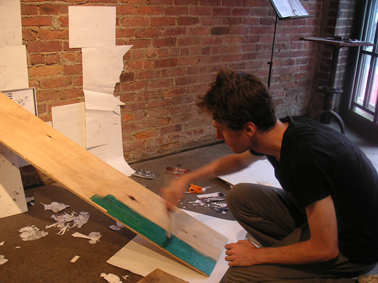 Three wooden boards found outside the gallery were taken into the gallery space and placed by the outer eastern wall. 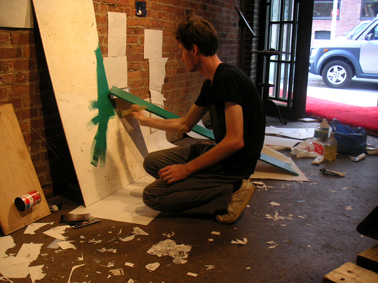 Two of these (leaning against the wall) were painted green. 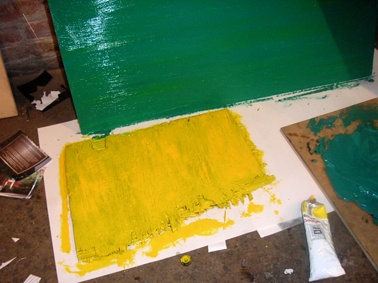 The third wooden board was painted yellow.